Terra cotta should always be set in either the natural (such as Rosendale or Utica) cements, or in Portland cement, mixed with sand, in about the same way as stone is set. As soon as set the outside of the joints should be raked out to a depth of ¾ of an inch to allow for pointing and to prevent chipping. The terra cotta should be built up in advance of the backing, one course at a time, and all the voids should be filled with mortar, into which bricks should be forced to make the work as solid as possible. 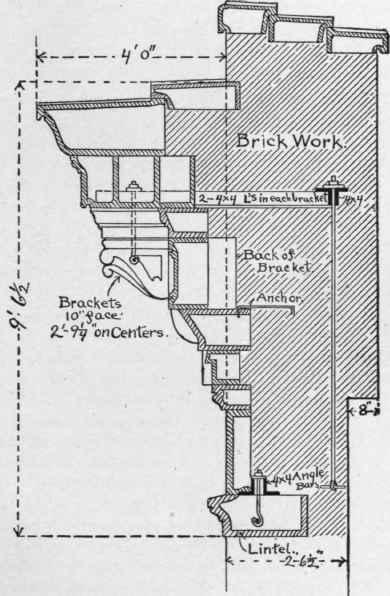 All blocks not solidly built into the walls should be anchored with galvanized iron clamps, the same as described for stonework, and, as a rule, all projecting members over 6 inches in height should be anchored in this way. * From the Clay Worker, by permission. Terra cotta work is generally set by the brick mason, but the specifications should distinctly state who is to do the setting and pointing. One of the principal objections to the use of terra cotta is the time required to obtain it, especially when the building is some distance from the manufactory. Some six weeks are required for the production of terra cotta of the ordinary kind, and the architect should see that all the drawings for the terra cotta work are completed and delivered to the maker at as early a stage in the work as possible, so that he may have ample time to produce it. Small pieces of terra cotta may sometimes be obtained within two weeks from the receipt of the order when the moulds are already on hand. It is always more expensive, however, to attempt to turn out work in such short order, and inexpedient on account of the risks in forcing the drying. 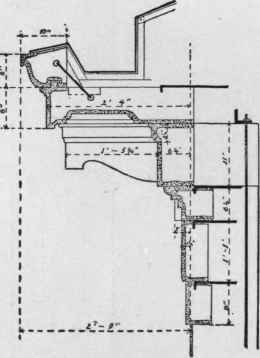 A single piece of terra cotta, or plain caps and sills, costs about the same as freestone, when the rough stone can be delivered at a price not exceeding ninety cents per cubic foot. When a number of pieces exactly alike are required, however, it can be produced in terra cotta cheaper than in stone, unless the terra cotta has to be transported at a large cost for freight. The advantage in point of cost in favor of terra cotta is greatly increased if there is a large proportion of moulded work, and especially if the mouldings are enriched, or if there are a number of ornamental panels, carved capitals, etc. It should always be remembered that if economy is desired it can best be obtained by a repetition of the ornamental features, so as to require as few different models as possible. When stock patterns can be used the cost is also considerably less than when the work has to be made from special designs. The use of terra cotta for trimmings, and especially for heavy cornices, in place of stone, often reduces the cost of the walls and foundations, as the weight of the terra cotta will be much less than that of stone, and the walls and foundations may be made lighter in consequence.